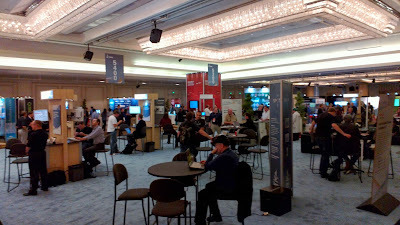 JavaOne is a brand which is recognised by Java developers the world over. Held in San Francisco, it may have suffered slightly since Oracle bought Sun (and it got relegated to be the smaller, sibling, conference of Oracle OpenWorld), but it still has an excellent vibe, great sessions and fascinating exhibitors. Sunday's technical keynote covered Java's prevalence and how Java - and Java developers - power the Internet of Things. This thread carried through the various speakers, with a chess-playing robot powered by a Raspberry Pi and, of course, Java. Today, the sessions kicked off in earnest, with Gil Tene's 08:30 talk on How NOT to Measure Latency providing some interesting techniques for measuring and demonstrating performance throughput. The tools, hdrHistogram and jHiccup are definitely worth a look.